Each chalet offers comfort on different levels with individually centrally heated sleeping areas, tiled floors, full height perspex sheets to enable interaction with other cats whilst still being able to find privacy and solitude should they so choose, double glazed opening window and cat flap, leading to an enclosed linked sun lounge area, with translucent roofing to allow your feline friend to bask in the sunshine without harmful UV rays. Each chalet has a full height scratching pad and a climbing frame to enable them to get the most out of the facilities we provide. Fresh water and a diet of your choice is provided. Soothing background music is provided as are a plentiful supply of cuddles. 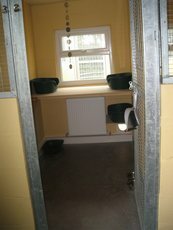 Run by an experienced team who both live adjacent to the cattery so you can leave your feline friend here safe in the knowledge that someone is on hand 24 hours a day to provide for their needs. Litter trays are changed daily and food intake monitored daily and in the unlikely event your cat should need veterinary attention, our practice offers a 24 hour call out. We know that caring cat owners will want to inspect the premises and take the opportunity to meet us both. We encourage you to do so, please contact us to arrange a visit. As lifelong animal lovers the team all understand and sympathise how stressful leaving your treasured pet can be, to which end we have devised a unique Text/MMS update on your cats's progress whilst you are away, should you so require. Janet is also a Reiki Master/Teacher who will give your cat a Reiki Treatment if required.